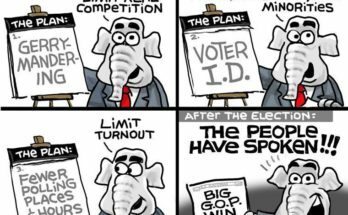 November 1, 2017 November 9, 2017 - by Rock Moses - 3 Comments. Disclaimer: Before I continue with this article, I want to say that many NAACP chapters across the country are putting in great work. The NAACP Legal Defense Fund is awesome, on the case, and definitely a BOSS in the fight for equality in the black community. Follow them on Twitter at @NAACP_LDF. In fact, I wish we could clone the NAACP Legal Defense Fund because the work they are putting in is 100%. The new president of NAACP – Derrick Johnson – has yet to prove himself, but the work he is putting in so far seems to be effective. I will keep watching his work and keep you posted. Again, many NAACP chapters in the United States are living up to the mission of the organization and putting in great work. But NOT the NAACP Gwinnett County, Georgia chapter. 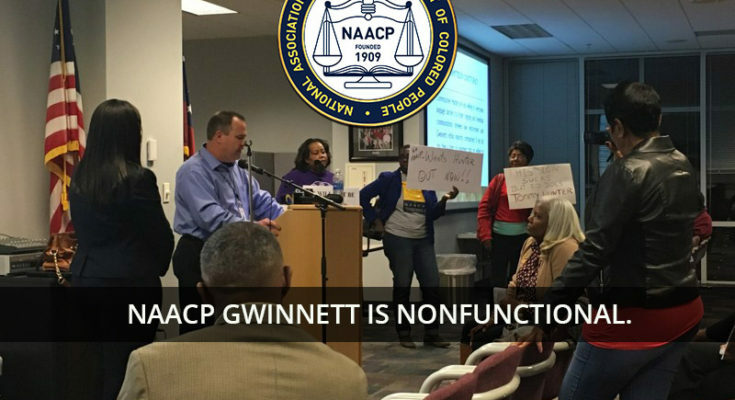 NAACP Gwinnett is unfunctional. Here is a snapshot of my experience with the NAACP Gwinnett Chapter to date. In August 10, 2016, I was fired up and ready to go support resistance once Donald Trump was named the presidential nominee for the United States of America by the Republican Party. After listening to black talk radio and getting inspired by Joe Madison and Karen Hunter on SirusXM Urbanview, I knew what I had to do. Get involved! I looked online and saw that the NAACP Gwinnett Chapter was having a meeting on that same that day. I joined the organization online and went to the chapter’s August monthly meeting. The meeting was at Salem Missionary Baptist Church that then president Michael Woodward attended. Upon arrival a woman – Annette Davis Jackson – in the parking lot stopped me as I pulled up and told me the meeting had been cancelled and that members were meeting at the Chick-fil-A right up the street. I tell you … that was the beginning of events that, in looking back, could never have been made up by anyone. Following is a timeline of the events from August 2016 until the posting of this article. August 10, 2016 – Joined NAACP Gwinnett Chapter. August 10, 2016 – Attended NAACP Gwinnett Chapter’s August monthly meeting that was cancelled at Salem Missionary Baptist Church by the president. All other officers (vice presidents, secretary) held the meeting at Chick-fil-A instead. Republican Annette Davis Jackson was there, regulating but yet said this was her first time attending the group’s meeting. August 11, 2016 – Called former chapter president Michael Woodward by telephone to voice my concerns about the NAACP Gwinnett Chapter meeting. Woodward was horrible on the telephone, defensive and just unbelievable. August 11, 2016 – Contacted Frances Johnson, president of Georgia NAACP (Michael Woodward’s fraternity brother) to voice my concerns about NAACP Gwinnett. September 13, 2016 – NAACP Gwinnett meeting. A very strange organizational meeting. Then president Michael Woodward spoke of himself in the third-person, informed members and visitors that he had been waiting on his fraternity and sorority sisters to do a voter registration drive, declared the chapter owed him money, and stated the chapter did not have money to buy stamps to mail NAACP election information out to members. September 28, 2016 – Formal complaint against Michael Woodward seeking his removal from office was filed by members of the chapter. September – November 2016 – Constant fighting over attempts to remove Michael Woodward by executive officers and members. Gwinnett NAACP had no community activity during this time, not even a simple voter registration drive . November 8, 2016 – Donald Trump elected president of the United States. November 15, 2016 – NAACP Gwinnett elections supervised by Georgia NAACP. December 12, 2016 – Marlyn Tillman sworn in as president of Gwinnett NAACP with Renita Hamilton Edmondson as vice president. January 27, 2017 – NAACP Gwinnett president Marlyn Tillman issues a press release on Gwinnett County Commissioner Tommy Hunter regarding his comments against John Lewis, civil rights activist. Tillman and Edmondson saw an opportunity to get publicity. February 11, 2017 – Special meeting with NAACP Gwinnett and Gwinnett County Commissioner Tommy Hunter which was a disaster. It appeared president Marlyn Tillman and vice president Renita Hamilton Edmondson had their own agendas for the meeting. Membership and executive members revolted. Republican Annette Davis Jackson attended to support Tommy Hunter and condemn NAACP Gwinnett members for standing up against him. February 2017 – Marlyn Tillman resigns as president of NAACP Gwinnett and vice president Renita Hamilton Edmonson assumes the presidency. February 2017 through Present – Members attempt to remove president Renita Hamilton Edmondson. July 20, 2017 – Notice of August 15th quarterly general meeting. August 10, 2017 – My account was debited for $30+ for annual renewal of NAACP Gwinnett’s membership – nonrefundable. Cancelled the recurring annual deduction for 2018. Special Notice – Please note Jacques Laurent resigned as treasurer effective Jan 8, 2017. Any acts made by Mr. Laurent in the name of the Gwinnett NAACP are deemed reckless and fraudulent. Also, Lorna Bledsoe is not membership chair for the Gwinnett Co Branch of the NAACP. Please only remit, send, or mail membership funds to chairwoman Melissa Howard, c/o Gwinnett Co NAACP P.O. Box 1491 Lawrenceville, GA 30046. Recently, unauthorized usage of our organizations name and stolen flyers were released into the general public with Corey Evans name. To be clear Corey Evans is not the secretary of the executive board of the Gwinnett NAACP and any correspondence from Mr. Evans should be immediately disregarded. This completes our special notice to the general public. Thank you! October 5, 2017 – A general NAACP Gwinnett Chapter meeting for October 10, 2017 announcement from Corey Evans. October 10, 2017 – Did not attend this meeting. 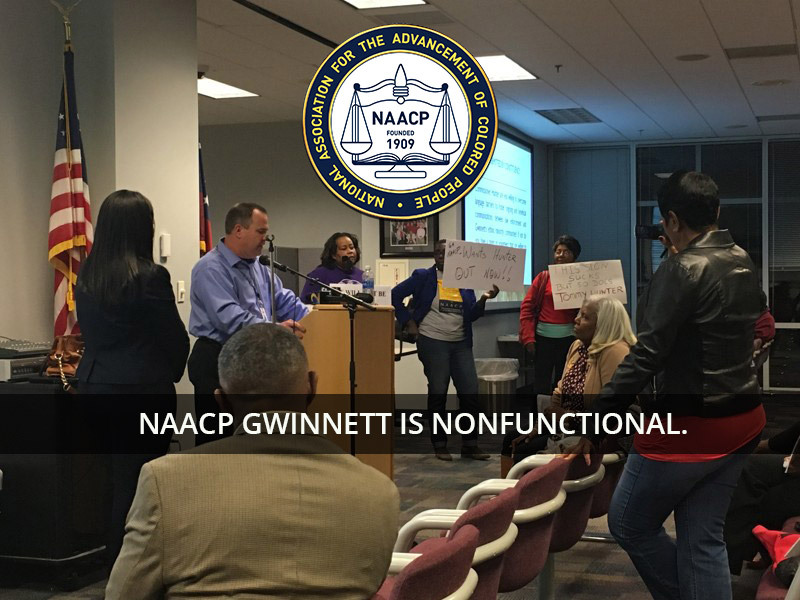 As of today, Gwinnett NAACP executive board members are still fighting over control. In my opinion, Gwinnett NAACP is beyond dysfunctional. The organization is unfunctional. 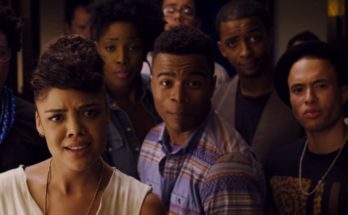 Perhaps the NAACP Georgia and/or national will step in to solve this chapter problem. My suggestion is to dissolve the chapter and allow each city (or a collection of cities) in Gwinnett County to form their own NAACP chapter as the community deems necessary. Each of these chapters would stand alone or make up the Gwinnett County NAACP Cluster of Cities. This will allow effective NAACP-missioned movement throughout Gwinnett County without being rendered useless by cultural conditioning, selfishness and a greed for power. Thank you for sharing your experience. I recently moved into the county and was looking forward to connecting with the NAACP chapter. After reading your post, I’m reconsidering. I would like to know about other county organizations that are filling the gap that is left by this NAACP chapter. Thanks, again! We are doing a follow-up article on NAACP Gwinnett Chapter this month as the organization is moving forward – literally – starting as a new organization with a president and officers who are about the business of NAACP. They were effective and instrumental – along with many chapter members – in removing the past group of NAACP Gwinnett Chapter leaders. Kudos to you for looking to get involved with organizations who are working in diverse communities of Gwinnett to make a difference. Also, National Action Network (NAN) has started a Gwinnett County Chapter, and we are spearheading that new membership drive – https://www.meetup.com/NAN-Gwinnett-County/. 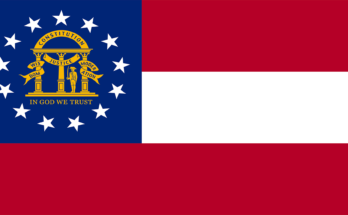 I am new to Gwinnett County (Buford) and am very interested in connecting with the local chapter here in Georgia. I am a transplant from New York where I was very much involved in voter registration , court watches etc. My focus with respect to voter registration was educating and registering former incarcerated citizens who were disenfranchised and unaware that once off of probation they were entitled to vote. I also organized volunteers to take elderly citizens to the polls to vote. I would like to join a chapter here that is progressive in continuing the mission upon which the NAACP was founded.